Ken Miller is just PLAIN OL'FUNNY. Over the past 10 years, He has stormed thru the ranks of comedy. He has become one of the funniest comics in the state of Florida. He was the 2009 Comedy Central South Beach Comedy Festival winner beating out 88 other comics. After finishing 2nd two years in a row, he finally won the 2013 Florida’s Funniest Comedy Competition beating out over 200 comics. He was chosen to compete/perform in the 2011 Laughing Skull Comedy Festival/Competition in Atlanta, GA, World Series of Comedy in Las Vegas in 2012 and The Great American comedy festival in 2013. Ken was recently seen on NICKMOMs, MOMS NIGHT OUT on NICKJR. 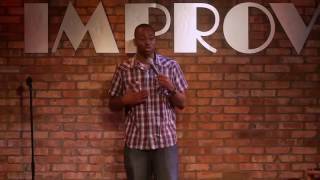 Originally from Greensboro, NC now residing in Orlando, FL the former US ARMY vet is number 7 out of 10 brothers and sisters(ok, he's really number 8 but 7 sounds better) Born for comedy and to make others laugh, Ken's show will guarantee you a laugh or he will pay for your first drink. Ken Miller can work any room. When you leave his show you will not be disappointed. A little over 10 years in comedy and he has been told by seasoned veterans that he has the stage presence of a 20 plus year pro.